making: ROBYN'S FETISH CHALLENGE #270 "ADD LACE"
Waking up to rain is been like this for the couple of past days. I totally love it but my kids are getting aggravated with it. I can't do anything anyway because I still have this boot on my leg from my fractured ankle. I do get to go this Wednesday to see if it has healed completely. I have had this thing on for two months and I'm ready to burn it. I'm very sentimental about keeping things and everyone wanted to know if I would keep this also. I said I will burn it. There is nothing sentimental about this thing. I can't do a lot of things with it and I'm trying to pack and clean this house up for when we move. So far they said everything is great with the loan. It's just going to take longer to get the approval. Who wants to add lace to their card? I have done a few with lace and they always look pretty. It makes a great border for the image you use or the border around the card. Any way you use lace it's a great added touch. So, this week our sponsor is The East Wind. This is a very unique store as her categories are named very different. She has Lucy Loo, Mon Amour Collection, and many more unique categories. Take a visit there and I'm sure you will definitely find something that you like. The East Wind is giving this prize for our challenge winner. Isn't she a beautiful fairy. The card is a little darker then shown here. When I cropped it and put my signature on it, the program focused on the flowers more then the rest of the card. 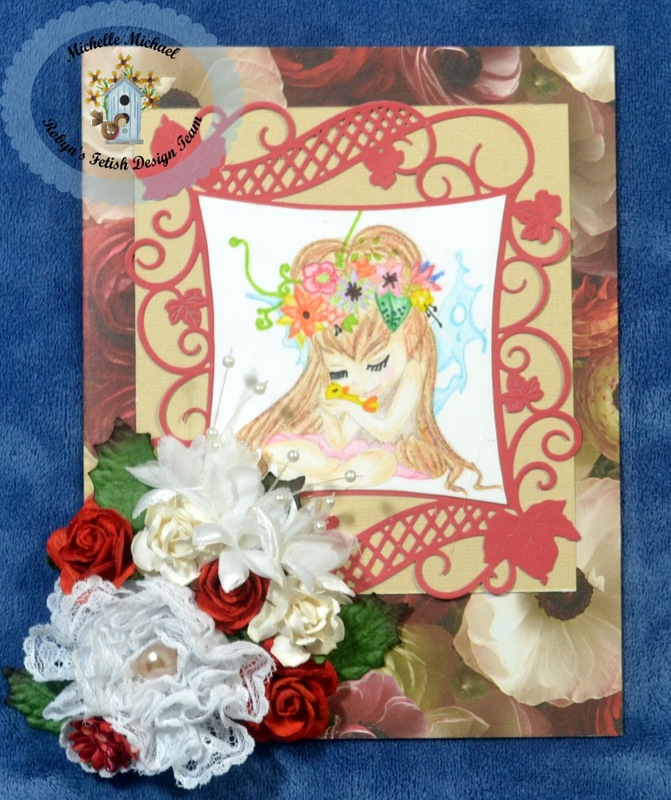 My lace that I added to my card is the lace flower that I made. I wanted to try something different with my lace this time. I think it turned out pretty for my first time making one. Now that I made one I want to try different colors. You may see more on my cards in the future. Here are my items that I used to make this card. I did use a lot of materials to make this card. I didn't put a sentiment as I could use it for many occasions. So, I would love to hear your opinion on my card. The challenge is at The Robyn's Fetish Challenge Blog and you will see more images that the Design Team made from The East Wind. Hope you enjoy everything and I will finish up right now. Wish me luck for my boot this week and I will see you all next week. Happy Sunday. Pretty card! Love the Spellbinder's die you used for this. It goes very nicely with the image. Very pretty lace flower; excellent for your first attempt at making them. Love the pearl in the center of it. Very nice card that can be used for many occasions. Thank you! Very pretty Michelle, love the lace flower. Great DT inspiration.